Fun and easy to make … pretty to look at … impressive to guests … delicious to eat! What sounds better than that? 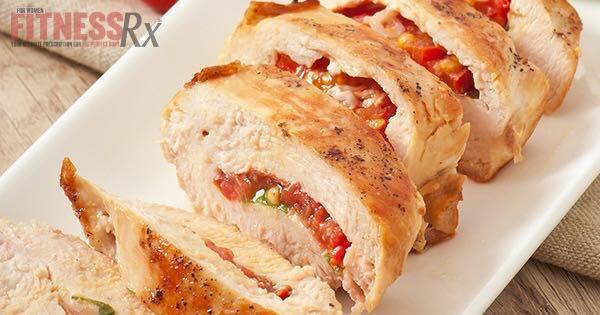 If you want to get this experience from your very own cooking, then my Tomato Basil Stuffed Chicken Breast is perfect for you! This beautiful dish looks a lot harder to prepare than it really is, thus impressing your guests (or just yourself for that matter). The tomatoes and basil cook inside the chicken, leaving it nice and moist, and provide awesome flavor. Combine this with the flavor and aromatics of the other seasonings and this is easily a chicken dish that can instantly become one of your favorites. Be creative and change up your filling ingredients in the future. It’s all about creativity when it comes to eating healthy and delicious! Enjoy! 2. Place a piece of aluminum foil onto baking pan and coat with non-stick cooking spray. Set aside. 3. Using a sharp knife, thinly slice tomatoes length-wise. Set aside. 5. Drizzle 1 tsp. olive oil onto each chicken breast. Then, sprinkle each chicken breast with salt, pepper, Italian seasoning, garlic powder, and Parmesan cheese. 6. Arrange tomato slices to one side of chicken breast, allowing enough room to fold chicken over to create the pocket. Next, break up basil leaves and arrange on top of tomatoes. 7. Fold each of the 4 breasts in half lengthwise so the chicken forms a pocket around the mixture, and insert a toothpick onto each end to hold together. 8. Sprinkle tops with an additional pinch of salt/pepper, if desired. 9. Place in oven for approximately 30 minutes, or until chicken is fully cooked and no longer pink and the tops are golden brown. Enjoy! Tip: slice before serving so you can enjoy the beauty of this dish!